The girls had tons of fun with the family in Kansas City. One highlight was checking out the cousins’ neighbors’ house. 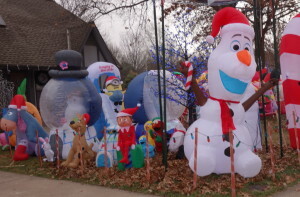 These people are deeply, deeply emotionally and financially invested in inflatables. It was like a wonderland. And it was particularly ironic because recently a guy asked me about where he could find a gigantic snow globe to take a cute family photo. That’s the kind of random request I get as editor at KidsOutAndAbout. But I had no idea. And then I asked folks via our Facebook page, and . . . crickets. Apparently there aren’t any adorable giant snow globes around the Capital District. Apparently, that’s because this family in Kansas City has bought them all. Seriously, it was nuts. But, you know, nuts in a nice way. 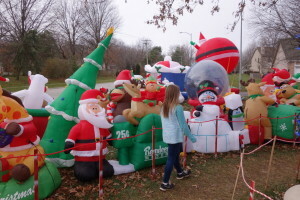 Because even though I can’t imagine wanting to pack my entire lawn with inflatable holiday fun, I appreciate that someone else wants to do it. It was like an amusement park. There were many, many more inflatables than you see here, so many that the entire lawn was covered, with little pathways staked out, and those pathways were worn out from all of the visitors. They even had an outdoor movie screen so that they can screen Christmas classics at night. So much fun. 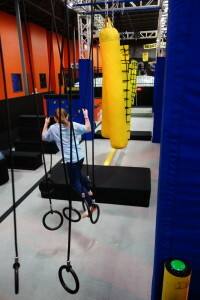 Speaking of fun, years ago we visited our first trampoline park, Sky Zone, in Kansas City. Shortly after posting about it, a Sky Zone arrived in Albany, along with a Flight Trampoline Park, where J had a birthday party. So here’s hoping that after posting about Urban Air, someone will decide to open a franchise near us (right now, the closest ones are 100+ miles away). Urban Air has many of the same features as our fun local places, like bunches of trampolines, a dodgeball area, and baskets for dunking. But they also had a section of trampolines set aside just for the preschool set along with my personal favorite feature, a series of obstacle course runs, American Ninja Warrior-style. Kids hit a button to start a timer, then tried to make it through the various obstacles. Both girls would have done better with a bit more height, but they sure had some fun! No wonder we all exhausted ourselves over break. We spent New Year’s Eve frantically unpacking and cooking so that we could bring food to parties. The we woke up bright and early on Friday when we got everyone’s favorite call, the one where you find out that your child barfed over your friend’s house during her sleepover. So J was sick and suffering through much of the day on Friday, recovering just enough so that the rest of us callously abandoned her for the evening to go see M’s first soccer games of her indoor season. The soccer games were fun, and so far I love this year’s coach. M’s been coming home from her Black Watch practices almost giddy with joy, which is especially funny because her coaches can be harsh. Which was fun to watch during the game, like when her coach pulled M aside and gave her a bunch of instructions while she was on the field, theoretically supposed to be playing, or when the coach yelled to another player, “Do you have a left foot?” Whatever, it seems to work. I’m knocking on wood, but M’s as happy as she’s ever been. And the team’s doing well. Or, as Cute W has repeated at least three times since we heard a parent of an opposing team say it during the game, these girls are no joke. On early Saturday morning I had a tv appearance, and after that we were through with our obligations and finally able to relax and recover. The tree’s down, although I’m still gathering all of the holiday stuff. It’s funny, but every year I love pulling it all out and putting it around the house, and then by January I’m so excited to take it all down. At some point after the stockings are emptied, it all magically morphs from joyful and festive to cluttered and claustrophobic. So reclaiming the house is a work in progress. Of course, now it looks like all that free space will be taken up by drying snow clothes, but c’est la vie.